Home » Bollywood News » Dhinchak Pooja's 'scooter' to get her arrested? 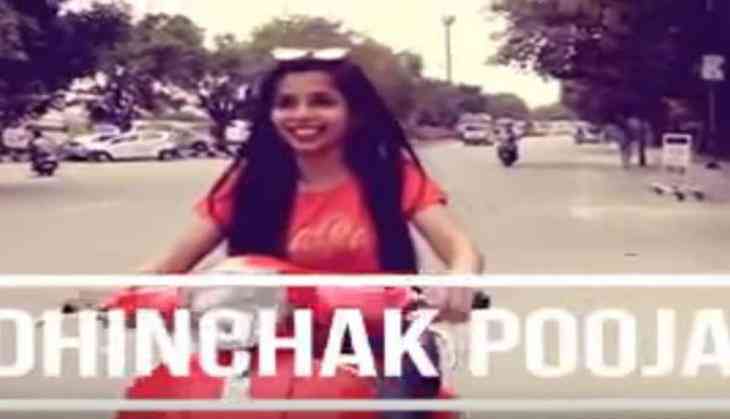 Her scooter might be 'dilo ka shooter' but looks like, it now will 'shoot' out some real trouble for the so-called 'music-sensation' Dhinchak Pooja. But, no, her singing is not the reason! Her recently released song, the third trending one on Indian Youtube, sees Pooja riding a red scooter without a helmet, to which a Twitterer posted to the Delhi Police, "Aapke sandarbh mein ye mohtarma bina helmet scooter chala rahi hain aur khoob shor kar ke gaane gaa rahi hai"
The tweet meant, 'This woman is driving a scooter without a helmet and singing loudly. In a reply, the Delhi Police assured that action would be taken against the 'Selfie Maine Leli Aaj' crooner. "Thanks,action will be taken," they wrote.